The Peabody Essex Museum currently has an Oto Faw Faw Coat on display for their Shapeshifting: Transformations in Native American Art exhibition (left image from Wicked Local Photo by Nicole Goodhue Boyd). The coat is associated with a religion led by William Faw Faw (Oto), who taught his followers to reject European influences and return to traditional ways. Movements such as this one were common among Native tribes at the turn of the century, when their ways of life were forcibly coming to an end. Interestingly, the coat follows the tailoring of European coat styles and is made using non-Native materials: wool cloth, glass beads, metal, and sequins. Yet, despite the materials, the coat is distinctively Native. 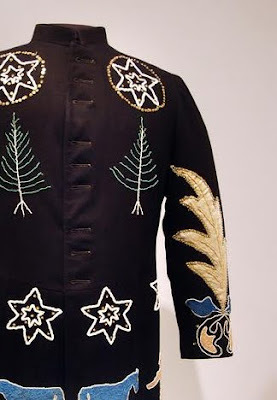 The beadwork is influenced by floral work of the Great Lakes tribes, and the beaded designs included cedar trees, stars, horses, human figures and birds. These designs were incorporated for their symbolic power. 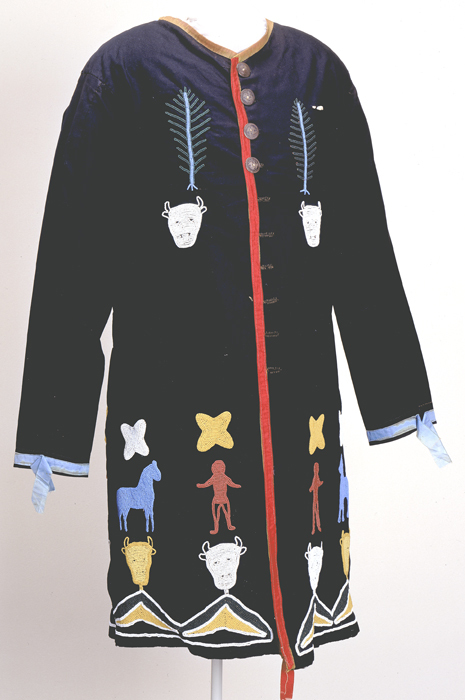 Other Faw Faw coats can be viewed at the Metropolitan Museum website, and the National Museum of the American Indian website, as part of their Song for the Horse Nation exhibit. The beaded cloth coat below is Central Plains (possibly Oto or Potawatomi), ca. 1895. Many of the coats feature tree symbols. Faw Faw's short-lived religious movement was centered on the ceremonial uprooting and replanting of a cedar tree. The ceremony involved six riders, and bison skulls also played a part. The coat below visualizes that ceremony (click here to discover more). Oh my gosh, this is my great great grandpa's coat! My mom did a mixed media painting featuring him in the coat. really cool! Your posts help me attain my mission - to find tons of historical "native fashions" pre and post contact and explore their creation - art, tailoring, design, etc. There is always something distinctively "native" about them I find, even when there are western influences. Wow, absolutely Native Haute Couture!